This success represents an important step toward showing that the new generation of optical atomic clocks is sufficiently robust and accurate to be used to redefine the official length of a second, which is based on microwave atomic clocks at present. The new study has been published in Optica, The Optical Society’s journal for high-impact research. Optical clocks are likely capable of much higher accuracy, probably 10 to 100 times better than what we measured in this work. To prove the true accuracy of these clocks without being limited by today’s definition of a second will require high-quality comparisons directly between various types of optical clocks. The working of clocks involves counting a recurring event with a known frequency, for example, the swinging of a pendulum. In the case of conventional atomic clocks, the recurrent event is the cesium atom’s natural oscillation, the frequency of which is in the microwave region of the electromagnetic spectrum. From the year 1967, one second has been defined by the International System of Units (SI) as the time elapsed during 9,192,631,770 cycles of the microwave signal synthesized by these oscillations. Atoms like strontium and ytterbium are used in optical atomic clocks as these atoms oscillate nearly 100,000 times more compared to microwave frequencies, in the optical, or visible, range of the electromagnetic spectrum. Such higher frequencies enable optical clocks to tick more rapid compared to microwave atomic clocks, rendering them more accurate and stable over time. The higher frequencies measured by optical clocks generally make it easier to control environmental influences on the atoms. This advantage could eventually enable the development of compact optical clock systems that maintain relatively high performance in a wide range of application environments. The team demonstrated that the time maintained by an optical clock is compatible with existing standard cesium atomic clocks by converting the frequency of a ytterbium optical atomic clock at NIST to the microwave region and comparing it with a collection of measurements from cesium atomic clocks from across the world. They realized frequency measurements of the ytterbium optical clock with an uncertainty of 2.1 x 10−16. This is equivalent to losing merely 100 seconds over the age of the universe (14 billion years) and has set a new record for accuracy in the case of cesium-referenced measurements of an optical clock. Despite being extremely accurate, optical clocks tend to experience considerable downtimes due to their prototype design and technical complexity. The NIST team used a collection of eight hydrogen masers to maintain the time when the optical clock was not operational. Masers are similar to lasers that run in the microwave spectral range and can reliably maintain time but have lesser accuracy. The stability of the masers—one of the best local time scales in the world—is one reason why we were able to perform such an accurate comparison to cesium. They achieved further reduction in the uncertainty by taking 79 measurements over a period of eight months. 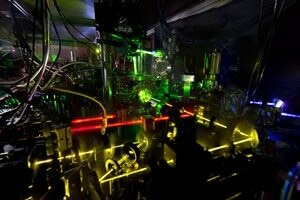 For the first time, the optical clock measurements have been taken over such a long time period. In order to gain better insights into the limits of optical clocks, the team aims to compare the ytterbium optical clock used in this research with optical clocks of other types that are being developed at NIST. Ultimately, it was possible to compare the NIST clocks with optical clocks in other countries to ascertain the types of clocks that would be ideal for redefining the SI second. According to the team, redefining the length of a second could still take some more years to achieve. Even if it is redefined, putting the new standard to application would necessitate technology that connects and transmits signals from optical clocks around the world in a better manner such that the accuracy of the time and stability are maintained.